Ai is a magnum oeuvre from the "I think Big" man Shankar. The film's post production has been going on for the past few months, and it is one of the most expected film from all corners. Now, we at Behindwoods have got something fascinating about the movie's story from a couple of trusted sources and we sure aren't going to be giving out spoilers here. Vikram apparently plays a boxer going on a revenge spree, to score it even with the people who took every bit of his life away. Ai is touted to be centered on a health care scam. Exclusive make up artists from America have been reportedly recruited for a very lucrative pay of close to 2 lakhs per day. The extensive make-up routine was accompanied by a humongous task which Vikram had to endure. 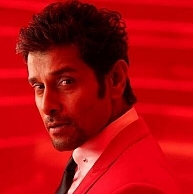 It seems extras were appointed to make sure that Vikram doesn't sleep with the make-up on, that might tighten his chest area resulting in a cardiac arrest !!! Looks like the Aascar Films produced "Ai" is sure to propel this tiring task master to a whole new level. People looking for online information on Aascar Films, Ai, Ai plot, Ai story, Chiyaan Vikram, Shankar, Vikram will find this news story useful.